For some the dark winter months bring an urge to hibernate. NOT SO at the Giants!! The volunteer activity is remarkable. The fruits of the summer have been harvested and now is the time to set things in motion for the future. 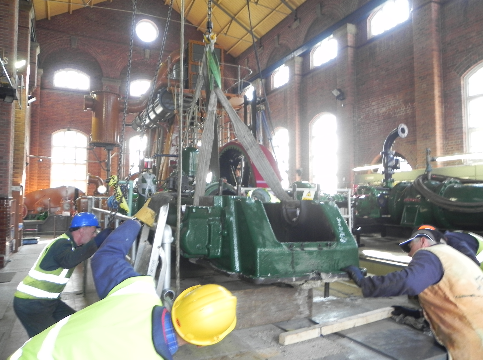 Last September the promised heritage diesel engines from the Environment Agency’s Appledore Pumping Station arrived and so did their pumps. The engines alone weigh nearly 10 tons each and the pumps were able to move 8000 gallons of marsh water per minute. That is 36 tons per minute! Some output! 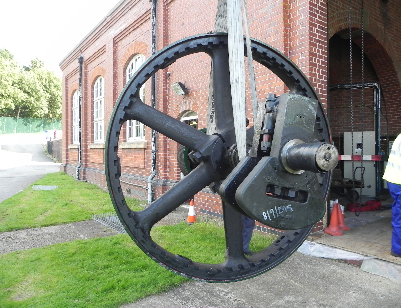 Each engine, and its pumps had to be dismantled to remove the equipment from its pump house, so it arrived at Brede in large pieces. The heaviest part is the flywheel coming in at nearly 3 tons, and the bedplate a mere 2.2 tons. Watch the blog page for further progress.